I pulled out my watercolors today- something I haven't done in a long time. 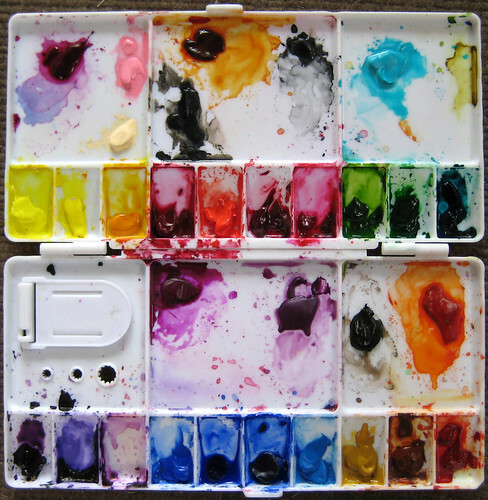 As I was painting, I remembered back to when I was trying desperately to build a basic palette of watercolor paints. Every site I visited suggested something different. Contrary to popular belief, every color of the rainbow cannot be created through mixing the three primary colors, (red, blue & yellow) with black and white. It's a little more complicated than that. There are warm and cool versions of each of those three primaries. Mix a warm red and a cool yellow, and you might end up with mud - especially if you are using the inexpensive student grade paints. I also never realized how much difference there was between student grade and artist grade watercolor paints until I broke down and bought some. Student grade paints contain more binder than pigment and they are often frustrating to work with when you try and mix them. This IS one of those situations where you will get what you pay for. 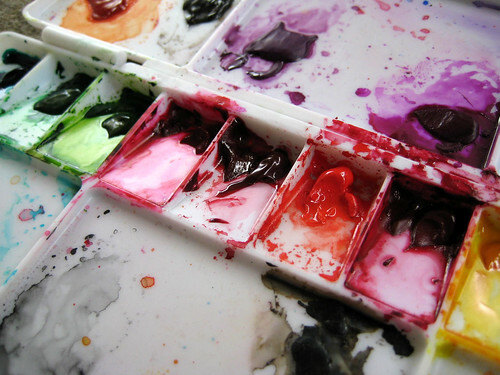 I know quite a few people that gave up on painting with watercolor because they could never get the colors to mix right, often resulting in muddy dull colors. Chances are they were probably struggling with student grade paints. When you start deciding what colors to add to your palette, don't do like I did and build a set of colors that might not suit your needs. Think first about what kind of painting that you want to be doing. Me? I am all about the abstract. I just don't do realism. Ever. And I lean more towards warm bright colors than cool ones. So what I'm saying, is that I have way too many colors on my palette- especially in the realm of blue. I don't use half these colors, and artist grade tube paint ain't cheap. As I bought different brands of paint, Holbein, Windsor & Newton, Schminke and Daniel Smith, I began to realize that even if the name of the color on the tube was the same from one brand to another, often times the colors were not. Some were brighter, or maybe the hue was off, and in some cases, some paints were much more pigmented than another. So if I had to do it all over again? 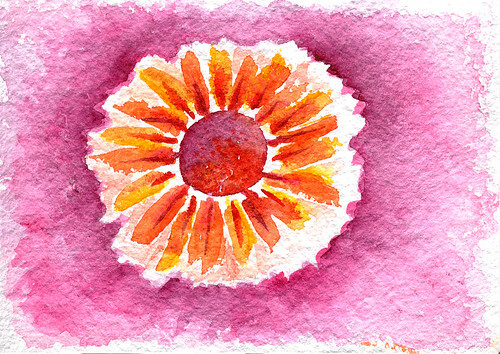 For me and my brightly colored abstract watercolor paintings? I'd buy all Daniel Smith paints. Super pigmented and bright as heck. They are comparable in price to the other brands, and the more you buy at a time, they give you discounts and free tubes of paint. Shipping costs are a little high, so I don't recommend buying just one tube of paint. If you want to try their paints with a relatively low investment, I suggest trying one of their Triads. 3 complementary colors bundled together and shipped for free. Nice, right?